Mavric Co.,ltd operate retail stores under the MAVRIC brands. We recognise the need for protecting the personal privacy of its customers and other third parties who provide their private information to us. We are focused on handling personal information in accordance with applicable privacy laws and regulation. This policy explains how we collect your individual information, what we should do with it, and exactly how it is protected. • device identification information (see the section headed 'Online and Digital Services' below for more info). If you're a candidate for employment, we may gather other information. This might include information associated with your employment background, working eligibility rights, suitability for the role you are trying to get, as well as your referee details. Normally we gather private information from you directly, when you visit our Petbarn or City Farmers retail locations, or our online stores. • where you access and interact with the website or the client service team including via social press sites (start to see the section headed 'Online and Digital Services' below for further information). If you make an application for work and complete forms applicable to the recruitment and selection process, we will gather your individual information during that process. We may also collect private information from third parties including through the acquisition of alternative party e-mail lists and from organisations with whom we have an affiliation. We may keep your personal information in hard duplicate (paper) or electronic form. If you provide information to all of us electronically, we retain these details within our personal computers and directories. Information held in digital form is generally held on servers controlled by us and on servers managed by third parties under contractual set up with us. We use physical security, security password safety and other procedures to ensure that personal information stored in electronic form is safeguarded from misuse, interference and loss and from unauthorised gain access to, modification and disclosure. Private information collected in hard copy (paper) form may be changed into digital form. Where this occurs, usually the hard copy is securely damaged by the end of the process. Information held in paper-based form is normally safely stored at our hq or at our retail locations. We use physical security and other measures to ensure that private information in hard duplicate form is shielded from misuse, interference and reduction and from unauthorised access, customization and disclosure. You have the choice of not identifying yourself, or utilizing a pseudonym, when working around (where this is lawful and practicable for example, when coming up with an enquiry or purchasing products from our shops). However, using circumstances, if we do not collect personal information about you, we might struggle to offer the products and services you have asked us to provide. • to reply to your questions, provide you with information or advice or consider and respond to demands or complaints created by you. If you are a applicant for employment, we may use your personal information to evaluate your suitability for a posture with us. • to adhere to laws or rules or to comply with any directions distributed by regulators or government bodies. The types of third parties to whom we might disclose private information to add delivery services providers, manufacturers, suppliers, distributors, marketing and communications agencies, data analysts, IT providers and our advisors including our professional advisors (including legal and financial advisors). We may gather, keep, use and disclose personal information for other purposes explained during collection. We might send you direct marketing and sales communications to keep you informed about products and services we offer and other products and services which may be of interest for youvia email, SMS, interpersonal media, or regular mail. When you have indicated a choice for a way of communication, we will endeavour to use that method wherever practical to take action. We acknowledge and respect our customers' choice to "opt-out" of direct marketing communication activities from us. 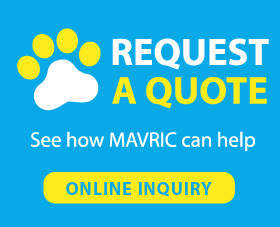 You may opt out of immediate marketing communications at any time by emailing info@mavricpets.com. You can even unsubscribe from email messages by clicking the unsubscribe hyperlink on the footer of the e-mail communication you have obtained. You have entitlement to access your personal information we hold about youon request. To ask for access to your individual information, please contact The Personal privacy Officer using the contact details set out below under 'Contacting Us'. In limited circumstances, access to your personal information may be declined relative to the Australian Privacy Principles. We might charge an acceptable charge for providing usage of your individual information. We will endeavour to keep your personal information accurate, up-to-date and complete. You can help us with this by letting us know if you see mistakes or discrepancies in information we hold about you and letting us know if your details change. If you consider any private information we keep about you is inaccurate, out-of-date, incomplete, irrelevant or misleading you are entitled to demand correction of the info. After getting a request from you, we will need reasonable steps to improve your information. MAVRIC take reasonable steps to delete or securely destroy or permanently de-identify your individual information where it is no more required and also to protect your personal information from unauthorised gain access to, disclosure, reduction, misuse and alteration. If you want to have your individual information taken off our records, you may request that your personal information be deleted or securely destroyed. You won't continually be possible to adhere to your ask for to delete or eliminate your individual information..